Les Suites Sarladaises is in the heart of the old Medieval center – now a pedestrian zone and uniquely lit by gaslights at night – and an easy walk to all major attractions. Sarlat is a lively town with two markets per week (Wednesdays and Saturdays) and a year-round calendar of interesting and entertaining activities for all ages. 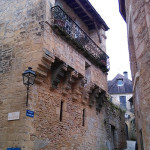 Sarlat-la-Canéda is approximately 550km/340 miles south of Paris, or about five to six hours driving time on toll roads (A20, exit Souillac). Sarlat is about 280km/110 miles west of Bordeaux, about two hours driving time, also on toll roads (A89) or and lesser national routes (N89 and D936). The nearest airport is Brive-la-Gaillarde-Vallée de la Dordogne, some 52km/32 miles to the east, but Brive has limited air service from Paris and London (http://www.aeroport-brive-vallee-dordogne.com/). You would need a rental car or taxi pick-up as the only public transport between Brive and Sarlat involves taking a local train to Souillac, then a bus. Bergerac-Roumanière airport is about 74km/47 miles to the west, with seasonal flights from Paris, Rotterdam, Brussels (Charleroi) and many UK airports. (Check for flights on http://www.bergerac.aeroport.fr ) There is also train service between Bergerac and Sarlat, a journey of about one and a half hours along the scenic Dordogne valley. This would require taking a taxi from Bergerac airport to the train depot in the city center. Bordeaux has a large and important international airport served by many airlines (http://www.bordeaux.aeroport.fr) and is connected to Bordeaux city center and the rail station by several reasonably priced bus options. For air travelers, Toulouse airport (http://www.toulouse.aeroport.fr/) is also an option as it is about the same driving distance and rail time as Bordeaux. Train service between Toulouse and Paris stops in Gourdon, Souillac and Brive, east of Sarlat, but a pick up would be required from either town (http://www.sncf.com/).